It's too soon for my Spidey senses to know how the winter will be, maybe by the end of august I'll have some clue. Japan getting frosty early.....earliest on record! Same in Georgia (the country). Fill your wood store. Would give some weight to Weathercheck's post. Last edited by sryanbruen; 22-08-2018 at 23:15. I don't know why this tickles me so much but the coldest day of the year in Ireland for 2009 & 2010 both landed on Christmas Day. Can we achieve scenes like this in Winter 2018/19? My opinion, not to this extreme. I believe 2019/20 holds the best potential for severity of cold/snow, I would love 2018/19 to be at least decent like 2008/09. Out of interest, what leads you to say this so far in advance, regarding 2019? Now that I finally have access to my PC (since it has been down all day and have been using a slow laptop), I can answer to you. Well my prediction comes from two factors, solar activity being the main defined approach towards it. Back in 2016, I was sure that we would get the chances of some harsh Winters come 2019 to 2021 because this is the period when I predicted solar activity to be slowly increasing after coming out of a deep solar minimum much like 2009 did. My estimates were that the highest chance of all for a harsh Winter was the one following the minimum point of solar activity, 2009/10 was the most recent example. I say chance because it doesn't always happen this way, 1868/69 was one and that became the mildest Winter on record - still unbeaten to this day and 2015/16 was the second mildest. A problem with 1868 could be that Autumn 1868 was very cold and as we know, nature loves to balance things out so the Winter was the mildest on record in comparison. I will try and work on some actual percentages using CET data from the UK Met Office and see what period of solar activity actually has the highest chance of being a harsh Winter historically. The issue with doing this is because every Winter is unique in how much solar activity has occurred and none are the same so I would have to make up fairly strict criteria for each different period, like a period just before the minimum point (which is usually 0), the minimum point itself and a period just after the minimum point. However, regardless of these issues, you know I love a good challenge that I set myself for when it comes to these sorts of things. 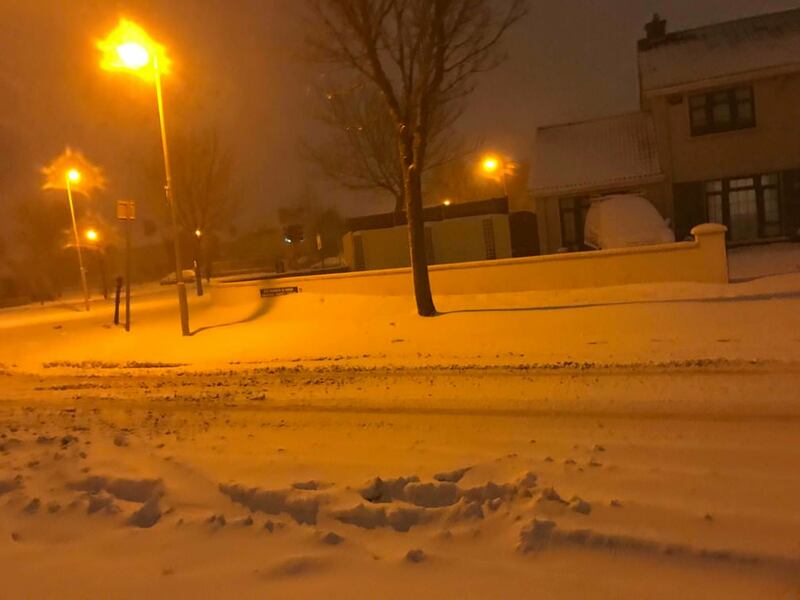 I have explained how the gulf stream declined in 2010 to a massive extent which gave away to less transport of mild air during Winter time towards Ireland and as a result, we had the coldest year since 1963 or 1986 (even coldest year on record for some like Dublin Airport). Me and some other weather enthusiasts I frequently talk to (whom study the Atlantic Meridional Overturning Circulation on a regular basis) think we will likely see a similar decline in the gulf stream sometime from 2019 to 2021 as explained in a post above. These likely predictions are based on historical occurrences like the solar activity so could be more coincidence than anything for all we know but we can only work with what we got. 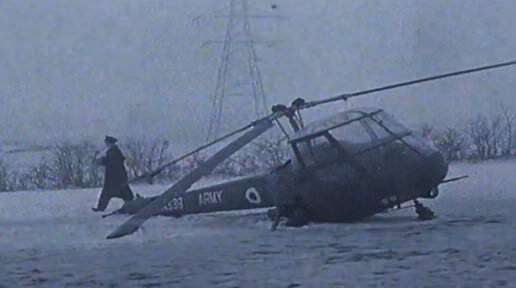 I think what sryanbruen is saying is that winter will be so cold that army helicopters will be freezing in seconds and falling from the sky over Scotland. Like these poor chaps in 1963 (except this was Ireland)? Here's the percentages I promised above in regards to Winters and solar activity. I also added in a table containing all these Winters for good measure and interest. I used the CET for the Winter mean temperatures (because it's the only dataset that goes back to solar cycle 1) and as this is based on the Central England region, remember there would be variety over the UK and Ireland in these Winters. I used the 1981-2010 average (which is 4.5c for the CET) to decide if a Winter is cold or not for the percentages. I'd like to give the disclaimer that we have a sample space of only 24 years for each solar activity period. Also, remember from a graph that I gave, there is no correlation with solar activity and the CET - though there is correlation with increased northern blocking. These are very high percentages for chance, unusually so. There's some interesting things here, I've found. First is the fact that going by the percentages, solar minimum provides the highest chance for a cold Winter though they're all reasonably close to each other so not big deviations. Nevertheless, solar minimum has the best chance which is different to what I estimated. 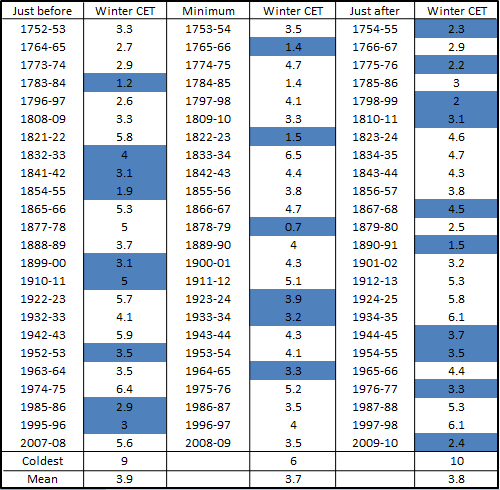 The bottom two columns of the table show the number of times that Winter was the coldest of the period (I also highlighted the coldest Winters of each period in blue) and the overall CET mean combining the Winters. There's more interesting things here. Just after solar minimum has had the highest number of coldest Winters for the periods but solar minimum has the coldest mean CET even though the number of times it was the coldest Winter is the smallest. So basically, I was somewhat off with my estimate and that the solar minimum Winter has the highest chance of being cold. 2018-19 is highly likely to be the solar minimum Winter so this is intriguing. Data comes from SILSO and the UK Met Office. Last edited by sryanbruen; 24-08-2018 at 12:17. Interesting analysis as always @syranbruen, I do have a feeling we're actually in for a deep sleep (maunder style). Regardless those 71% and 79% figures are relatively close and so assuming this winter is the minimum then either could end up the coldest. It's all stacking up very nicely for this winter so far anyway, if you like colder weather that is. The next thing to watch will be Eurasian snow cover extent progress as we go through the Autumn. Finally, isn't there a greater chance of an easterly occurring during winter when the qbo is in an easterly phase? Last edited by nacho libre; 24-08-2018 at 21:39.